One night we were in deep sleep, suddenly there was a unbelievabale tremor waked us both. The whole building was rocking like a boat! The utilities in the room were on the role getting scattered here and there! A strong Earthquake! I grabed Nimmi close to my chest and some how managed to reach the lawn using the stairs. Others also managed to come down with the terrified crying children pulling and pushing! Most of us were awfully horrified and scared being suddenly awakened at the dead of night! Some were shivering! The building was still swinging off and on. All could feel the tremor even standing on ground so, all of us moved away from the building and dashed to the ground close to one another in the garden at a safe distance. Every body was dumbed founded and were trying to console one another lloking around helplessly. A few got senseless due to shock! We were trying to get them back to their senses sprinkling water on their faces. Whole thing was a matter of minuites. Mild tremor was still occurring from time to time. In the meantime, Fire Brigade and Ambulance arrived. All most at the same time arrived two trucks load of PLA soldiers with various rescue equiptments and materials. Trained soldiers coolly surched the whole building looking for any left over person. They rescued a few aged people who were unable to come down scaling the stares and sent them to the hospital by the Ambulance. We all were in a state of shock and remained speechless with such an unexpected and suddenly occurred event! Nimmi was continuously reciting Dua and Duruds in a muted mode. It was a rare experience in our life. We had to spent that night in the tents on the ground under open sky. Next day we learned that such a intense Earthquake had never happened in the history of China. Two port cities and industrial hub Tien Xing and Shen Yang 150 Km away were completely raised to ground. After this Earthquake we had to live in tents for all most two weeks. Such an incident remains unforgettable. After this devastating news was propagated in outside Media, Most of the foreign countries including UN extended helping hands for rehabilitation of the affected people but the Chinese leadership respectfully refused to take any foreign assistance. The whole world community was astounded observing the self dignity of the Chinese nation. I went to visit the effected areas. The sight was heart aching! In both the cities I could find not a single standing building. Every thing was raised to ground and turned into hips of concretes. Thousadns of people had died. Lacs of infants and adults had became destitudes but I couldn’t find any remorse any where! Every where I saw male and female, young boys and girls are engaged in rehabilitation and reconstruction work day and night shoulder to shoulder with the PLA solders. The entire world got surprised to see that within two years the Chinese had been able to reconstruct Tien Xing and Shen Yang as the most modern industrial and port cities. An ashtonishing feet in deed! While staying at Xin Chao hotel we could develop friendly relation with quite a few revolutionary families from different counties. All of them were given political asylum and had been living there as honored guests of the Chinese government. In the election of 1979 BNP formed the government with more than 2/3ed majority. Indemnity Act was passed in that Parliament with over 2/3ed majority thus the indemnity Ordinance earlier issued by President Mushtaq Ahmed was ratified and the indemnity Act became the part of the Constitution through 5th amendment. Gen. Zia’s BNP had to give Contitutional validity under compulsion because, the basis of his politics was 15th August revolutionary armed uprising and in continuetion of that the 7th November soldier and people’s revolution. 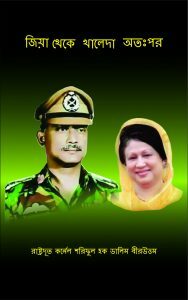 As Gen. Zia backed out from his promise and did not allow either Khandakar Mushtaq Ahmed or Col. Rashid and Col. Faruk to take part in the Presidential and Parliamentary elections, Col. Faruk returned to Bangladesh to do open politics. But Gen. Zia threw him into Jail without any reason or trial. In protest we all had submitted our resignation but Gen. Zia did not accept our resignations. After about 2 years of imprisonment Col. Farukh was brought out of Jail and forced him to leave the country. From this one thing became clear that Gen. Zia will never allow the leaders of the August and November revolutions to return back to the country and to do open politics for his own, Awami League and Indian interest. In view of the above, the decision was taken that to counter the politics of compromise introduced by Gen. Zia, to materialize the spirit and the dream of ’71, a 3ed force must be created on the basis of the aim, idiology and the political action plan of Sena Parisad clandestinely. We received overwhelming response from the real patriots, believers in religious values and nationalists from every sector within the country. There after we started deliberate seriously how can we advance to organize the party.